A parade of teachers, parents and others lined up Monday to ask the state Board of Education to reject efforts by the state schools chief to alter -- and they believe dilute -- academic standards. Arizona’s charter schools are indeed a success story for our state. Our leaders should be applauded for having the vision to carefully create a climate in which school choice benefits so many through specialized learning, improved test scores, and education options. 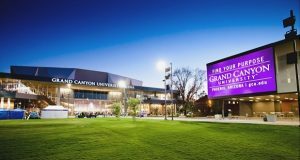 After 14 years as a for-profit university, Grand Canyon University turned back the clock and reverted back to its non-profit status as of today. What began as interview with Grand Canyon University President Brian Mueller about GCU’s tuition fee freeze, now on its 10th consecutive year, quickly spawned into a free-wheeling discussion about how Americans are rethinking the value of a college degree. Following the defeat of a high-priority bill that would have given Grand Canyon University a massive property tax break, the school is looking to wade into the world of electoral politics. While we debate what it takes to fortify Arizona’s future workforce, we must also consider what citizens, organizations, educators and governments can do to transform our schools and our inner-city neighborhoods, too. The budget framework approved by legislative leadership and Gov. Doug Ducey appears to give a green light to a contentious proposal that would dramatically reduce property taxes for Grand Canyon University and, in the process, raise them for others who live near the school. As the host and managing editor of “Arizona Horizon,” Ted Simons sits down each night with some of the state’s heaviest hitters, from governors to state and local lawmakers.